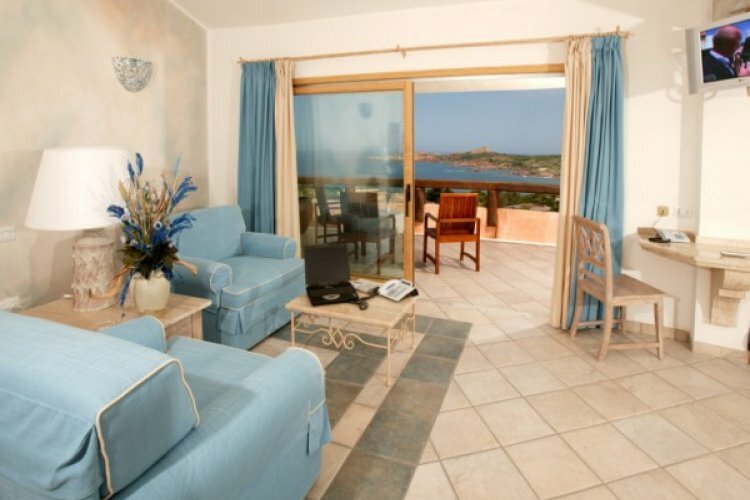 The Marinedda Hotel is based in the stunning,quaint fishing village Isola Rossa on the north west coast of Sardinia. The beautiful village is surrounded by three breathtaking beaches and the Marinedda Hotel lies just a few steps away. Isola Rossa is a romantic enchanting place filled with shops, bars and restaurants and a beautiful harbour plus gives one of the best sea views in the whole of Sardinia. The superior four star Marinedda Hotel is positioned on a gentle hill looking over the stunning beach and crystal clear sea which is just 250m from the hotel. Enjoying a privileged spot the Hotel offers 195 guest rooms set in two storey bungalows and furnished in a typical Meditarrenean style. All acommodations come with modern amenities for a perfect stay. The hotel houses one of the most prestigious Thalasso Spa & Beauty Centres in the Mediterranean, offering a wide range of treatments, a hydro massage pool, two swimming pools and a sports and fitness centre. Ideal for those looking for a peaceful and relaxing break. The restaurant in the hotel 'Petra Ruja' offers stunning views over the bay, delicious buffets with a wide range of international and local cuisine as well as themed dinners weekly. A Meditarranean brunch can also be enjoyed in the daytime offering traditional pastas, cold dishes and a wide range of salads,fruits and local cheeses.